Axe Party Of The Year. Golden Tickets. People love to party and so do we, but that’s so mainstream. We might call it the “AXE Party of the Year” but it’s AXE’s quest to explore modern masculinity and show it. The modern man is exploring his masculinity and striving to reinvent himself. The AXE Party of the Year is a celebration of young talent collaborating to “Find their Magic”. 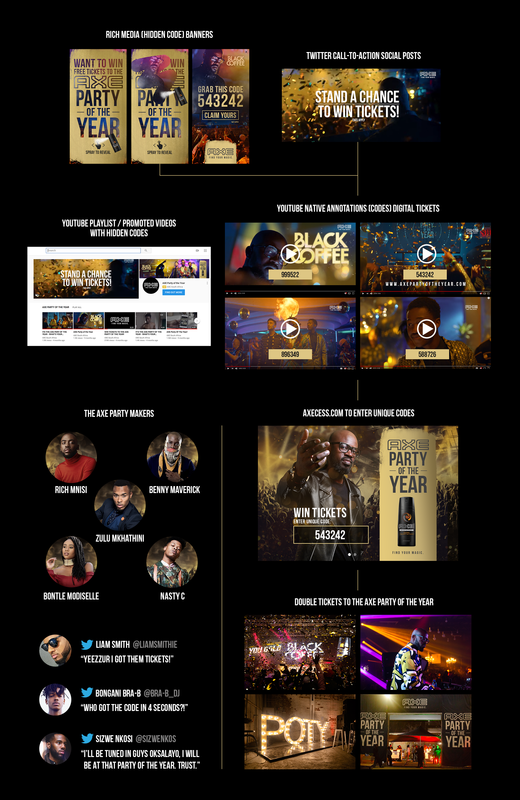 It’s a Party where tickets aren’t for sale; they are earned, rewarded and awarded in collaboration with Black Coffee and the AXE Party Makers. Building hype to the Party where we launched the new AXE Gold product range, Black Coffee composed an Axe Gold Master Mix for the Party. Nasty C documented his journey in creating a track for the party. Bontle brought her moves and crowdsourced her dance team, Richi brought his threads and style. Unique content from our AXE Makers saw new music, fashion and dance material organically roll out throughout the campaign constantly building to the Party, showcasing and reaffirming our “Find Your Magic” message. We published a variety of tactical media banners and content pieces that lead to finding digital “golden tickets”. We hid instant winning ‘ticket codes’ across our digital and social platforms, driving our fans to take part in a digital scavenger hunt and to Find Their Magic at the Party of the Year. *Golden Tickets; Utilizing YouTube’s native annotations “cards” to hid our codes we drove views to the AXE Party of the Year website where fans input their found codes for the chance to instantly win. The Golden ticket “coded” video was hidden within the AXE YouTube Channel playlist, incentivising hopefuls to explore more AXE content. Promoted Campaign pre-roll videos on YouTube further supported our golden ticket incentive and prompted them to play/search each week as we released more unique codes. Those first to input the code would win. With much social engagement from fans anticipating the next release. These Golden ticket Codes were also hidden in scratch “Spray- to-reveal” display banners to be claimed on the AXE Party of the Year website for an instant win. All codes hidden, placed and broadcasted were redeemed – which gave us a 100% success rate. These lucky ticket winners joined the Party alongside the AXE Makers, top influencers, celebrities and well-known Artists to witness new Music, style trends, fashion and dance; and the launch of New AXE Gold reveal.